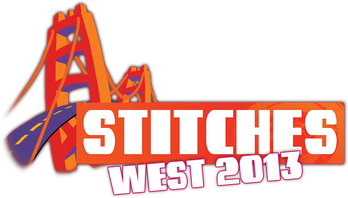 November 16-17 - Bay Area Bead Extravaganza - BABE 2013! Held at the Oakland marriott Civic Center Hotel, 10th and Broadway, Oakland, CA. Showing Jewelry and Supplies. November 14-15 - Cavandoli Workshop at BABE! This workshop is sold out. Many great classes offered by outstanding teachers are still available. Check Classes or sign up to receive future Workshop & Class News > Sign Up! November 16-17 - BABE 2013! Bay Area Bead Extravaganza. Marriott Oakland Convention Center, CA. Showing finished jewelry and DIY supplies. This is not your usual bead show. BABE has some amazing vendors, artisans' beads and classes. At this show, I always try to find a bit of time to get unique supplies not available elsewhere. Saturday, August 10 - C-Lon News - New Colors Just arrived!!! Many of you asked for them. C-Lon responded. Here they are. They are bright, a bit blinding and they will get everyone attention. It is like getting a straight shot of espresso in a color form - they are so bright, they may even glow in the dark. Compare with Poinsetta, a C-Lon Bead Cord color. It used to be the brightest color in the C-Lon Collection. Iit just got outshined by the new Neon colors. It's official. Marion Jewels in Fiber has relocated 200 miles northeast to Chico CA. The new mailing address is PO Box 6776, CHICO CA 95927. New phone is 530.774.2244. New fax line is 530.748.0585. We were closed the week of July 4th through July 14th. Unofficially we shipped through July 4th at noon. Any order placed after that time will be shipped in the order received. Shipping resumes on Monday, July 15th.We should be back to normal by Wednesday. Thanks for understanding! 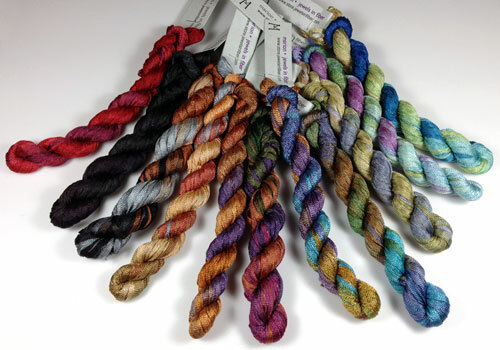 This variegated hand dyed rayon ribbon is perfect for kumihimo. It has a knitted tube structure and it makes a 8 strand round braid of about a 3 mm in diameter. 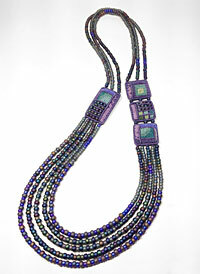 It can be braided as is or with beads. 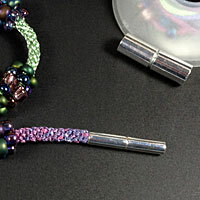 Beads can be added directly to this ribbon as it collapses onto itself making it possible to insert beads right onto it with a tapestry needle Size 24. The beads need to have soft edges such as high quality Japanese glass beads. 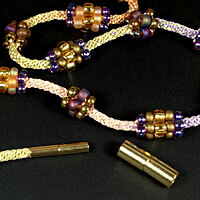 Fun: 20 new colors of the C-Lon Fine Weight Tex 135 Bead Cord are planned for this year. It will bring the representation in this size to 44 colors. It is super news for all who like working with this size as 24 colors was a bit short. We all like to have choices. 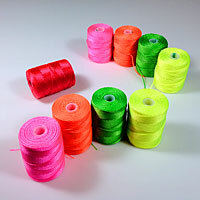 More Fun: C-Lon is back to choosing potential new colors to extend the C-Lon Bead Cord Collection. Yes the one that already has 104 colors... This involves choosing shades that fill in gaps in the current collection, getting sample bobbins from the factory, and making choices. It is a long process. 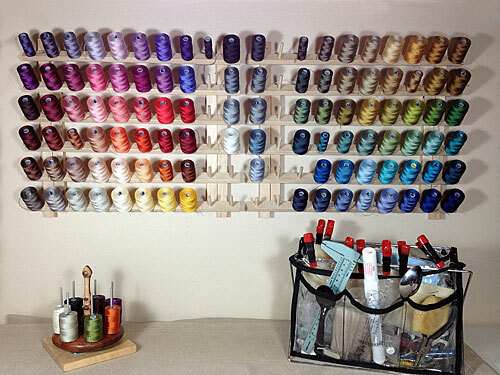 It involves choosing samples from thread snippets, getting sample spools, selecting the finalists, and then placing orders for a few colors at a time as it takes lots of money to add a new color. C-Lon has asked my help in this process, so yes I welcome your suggestions. Keep in mind that translating from something like a colored piece of paper or a Pantone color to dyed thread will definitely change the look and 'feel' of the color to some degree. Even from snippets of thread to bonded nylon there are subtle yet noticeable shifts. I will be choosing my suggested snippets for the next month or so. Email me and let me know about colors you have been dreaming about! Not fun: The factory raised prices in February. C-Lon raised their prices last weeken, It is nothing too dramatic, but some adjustment to prices will have to take place soon as new inventory with higher prices come in. For market admission > Print card for $3.00 off the admission! C-Lon: In 2012 we got many new colors of C-Lon Tex 400, in 2013, we can look forward to an expansion of the Fine Weight Tex 135 Cords with 16 new colors. 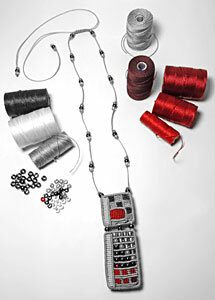 Chinese Knotting Cord: I am committed to continue to have the best offering available. 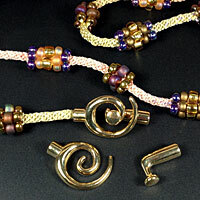 Findings: New Gold and Silver Tone Clasps - Coming up as soon as soon as I get pictures made. Tutorials & Kits: Sign up for news to find out about new ones! Classes: Limited to a few classes this year so sign up for news!